Her royal highness Hoover is at it again. 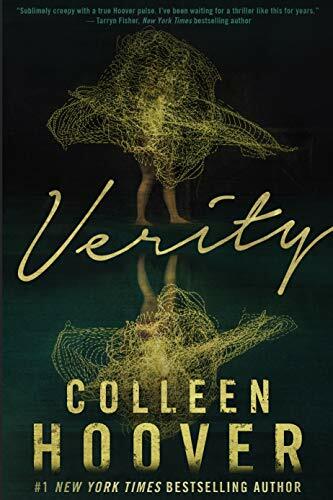 Bestselling author Colleen Hoover surprised fans today by revealing the cover for her upcoming novel titled ‘Verity’. It’s set to release on December 18th this year, giving you less than three months to recover from the emotional ride that was ‘All Your Perfects’. We’re almost positive it won’t be enough time to heal our heart and soul, but Hoover knows best… we hope. Professional make believer Colleen Hoover is known for her amazing ability to make readers giggle with joy and weep with sorrow within one chapter (or a few sentences, depending on which book you’re reading), but this time the romance author took a different turn and decided to give a different genre a shot- psychological thrillers. It’s the plot twist we never knew we needed until it happened. Her inspiration for writing such a story came from a minor mistake when Amazon and a couple of other websites classified her book ‘Without Merit’ as a psychological thriller, its true placing being under young adult fiction. The author jokingly stated that she might as well go and write a psychological thriller since Amazon seems to lowkey demand it. How’s that for a synopsis? You can preorder the book here on Amazon. So what can we expect out of all of this? While readers are used to Colleen causing an emotional rollercoaster, are we truly ready for a psychological rollercoaster? Will she give Gillian Flynn a run for her money? Have years of writing crawl-under-a-blanket-and-cry-while-you-laugh romance been leading up to this dark tale that will surely mess with your head? Whichever way this goes, we have no doubt that Colleen Hoover will not disappoint her readers and her loyal CoHorts. That is of course unless she pulls a George R. R. Martin and kills every other character. Now that’s a plot twist we’re hoping won’t happen. You can follow Colleen on her Facebook, Twitter, and Instagram account, plus you can visit her website for more tear-jerkers. Also, you can subscribe to The Bookworm Box (created by Colleen) for a monthly dosage of signed books and book swag, and the best thing is- all profits go to charity!